The use of natural gas, of which methane is the principle component, is increasing worldwide. It also has many industrial uses, such as the manufacture of chemicals like ammonia, methanol, butane, ethane, propane and acetic acid; it is also an ingredient in products as diverse as fertilizer, antifreeze, plastics, pharmaceuticals and fabrics. Natural gas is transported in several ways: through pipelines in gaseous form; as liquefied natural gas (LNG) or compressed natural gas (CNG). LNG is the normal method for transporting the gas over very long distances, such as across oceans, while CNG is usually carried by tanker trucks over short distances. Pipelines are the preferred transport choice for long distances over land (and sometimes offshore), such as between Russia and central Europe. Local distribution companies also deliver natural gas to commercial and domestic users across utility networks within countries, regions and municipalities. Regular maintenance of gas distribution systems is essential. Identifying and rectifying gas leaks is also an integral part of any maintenance programme, but it is notoriously difficult in many urban and industrial environments, as the gas pipes may be located underground, overhead, in ceilings, behind walls and bulkheads or in otherwise inaccessible locations such as locked buildings. Until recently, suspected leaks from these pipelines could lead to whole areas being cordoned off until the location of the leak was found. Precisely because conventional gas detectors – such as those utilising catalytic combustion, flame ionisation or semiconductor technology – are not capable of remote gas detection and are therefore unable to detect gas leaks in hard to access pipelines, there has been a lot of recent research into ways of detecting methane gas remotely. Cutting edge technologies are now becoming available which allow the remote detection and identification of leaks with pinpoint accuracy. 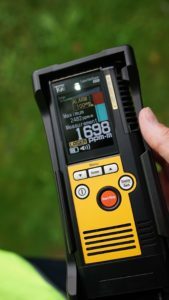 Hand-held units, for example, can now detect methane at distances of up to 100 metres, while aircraft-mounted systems can identify leaks half a kilometre away. These new technologies are transforming the way natural gas leaks are detected and dealt with. Remote sensing is achieved using infrared laser absorption spectroscopy. Because methane absorbs a specific wavelength of infrared light, these instruments emit infrared lasers. The laser beam is directed to wherever the leak is suspected, such as a gas pipe or a ceiling. Because some of the light is absorbed by the methane, the light received back provides a measurement of absorption by the gas. A useful feature of these systems is the fact that the laser beam can penetrate transparent surfaces, such as glass or perspex, so it may be possible to test an enclosed space prior to entering it. The detectors measure the average methane gas density between the detector and target. Readings on the handheld units are given in ppm-m (a product of the concentration of methane cloud (ppm) and path length (m)). In this way, methane leaks can be quickly confirmed by pointing a laser beam towards the suspected leak or along a survey line, for example. An important difference between the new technology and conventional methane detectors is that the new systems measure average methane concentration, rather than detecting methane at a single point – this gives a more accurate indication of the severity of the leak. The benefits of remote technology for monitoring pipelines in urban settings are now being realised. The ability of remote detection devices to monitor gas leaks from a distance makes them extremely useful tools in emergencies. Operators can stay away from potentially dangerous leak sources when checking the presence of gas in closed premises or confined spaces as the technology allows them to monitor the situation without actually gaining access. Not only is this process easier and quicker, but it is also safe. Moreover, it is not affected by other gases present in the atmosphere since the detectors are calibrated to only detect methane – therefore there is no danger of getting false signals, which is important in emergency situations. The principle of remote detection is also applied when inspecting risers (the above-ground pipes carrying gas to the customers’ premises and normally running along the building outside walls). In this case, the operators point the device towards the pipe, following its route; they can do this from ground level, without having to use ladders or access the customers’ properties. In addition to detecting gas leaks from municipal distribution networks, explosion-proof, ATEX approved devices can be used in Zone 1 hazardous areas such as petrochemical plants, oil refineries, LNG terminals and vessels, as well as certain mining applications. When inspecting an LNG/LPG underground tank, for example, an explosion-proof device would be required within 7.5 metres of the tank itself and one metre around the safety valve. Operators therefore need to be fully aware of these restrictions and equipped with the appropriate equipment type. Some instruments now allow spot methane readings to be taken at various points around a site – such as an LNG terminal – automatically generating GPS tracking of the measurement readings and locations. This makes return trips for additional investigations far more efficient, while also providing a bona-fide record of confirmed inspection activity – often a prerequisite for regulatory compliance. Moving beyond hand-held devices, there are also remote methane detectors which can be fitted to aircraft and which detect leaks from gas pipelines over hundreds of kilometres. These systems can detect methane levels at concentrations as small as 0.5ppm up to 500 metres away and include a real-time moving map display of gas concentrations as the survey is conducted. The way these systems work is relatively simple. A remote detector is attached beneath the aircraft’s fuselage (usually a helicopter). As with the handheld device, the unit produces an infrared laser signal, which is deflected by any methane leakage within its path; higher methane levels result in more beam deflection. These systems also utilise GPS, so the pilot can follow a real-time moving map GPS route display of the pipeline, with a real-time display of aircraft path, gas leaks and concentration (in ppm) presented to the crew at all times. An audible alarm can be set for a desired gas concentration, allowing the pilot to approach for closer investigation. The range of remote methane detection systems is increasing rapidly, with new technologies being developed all the time. All these devices, whether hand-held or fitted to aircraft, allow quick, safe and highly targeted identification of leaks – whether beneath the pavement, in a city or across hundreds of kilometres of Alaskan tundra. This not only helps prevent wasteful and costly emissions – it also ensures personnel working on or near the pipelines are not exposed to unnecessary danger. Because the use of natural gas is increasing worldwide we foresee rapid technological advances in remote gas detection in applications as diverse as leak survey, transmission integrity, plant and facilities management, agriculture and waste management, as well as process engineering applications such as coke and steel production. Each of these areas have situations where access may be difficult, combined with the need to put personnel protection at the top of the agenda. Opportunities for remote methane detectors are therefore growing all the time. What is the unit price of this instrument? Is it manufacturing in India? Can you provide product brochure for more detail? Receive up to the minute news and information from the gas detection industry.